I realised, “Oh, crap. That’s going to have to be me.” Or that’s going to have to be people like me, who want to see the change going on, and realise that the political process doesn’t involve waiting every three years for an election to come along. Shane: So our guest tonight is Finn Campbell from Generation Zero. Finn is a masters student at Otago University, studying politics. Generation Zero is a youth-led organisation in New Zealand, focus on transitioning society away from its dependency on fossil fuels, and combating climate change. And you’ll know if you’re a regular listener to our show, we’ve had Generation Zero on several times over the years. So, Generation Zero was founded with the central purpose of providing solutions for New Zealand to cut carbon pollution through smarter transport, liveable cities, and independence from fossil fuels. And the group believes that young people must be the forefront of tackling climate change, and that young people are the inheritors of humanity’s response. Welcome to our show. Finn: Hello, how are you? Shane: Not so bad. So, before we go on to talk about Generation Zero, let’s tell a little bit about yourself. Where were you born, and where did you grow up? Finn: I was born in Christchurch when my dad was doing his PhD. Quickly moved over to Wagga Wagga – in Australia – for the first two years of my life. Didn’t have a great impact on me. Don’t really remember it, being a young child. And then Dad got a job at the University of Otago, and I spent the rest of my life here, living in sunny old Dunedin. Shane: So what schools did you go to? Finn: Opoho Primary was my first school, right around the corner from the house. Went down to Dunedin North Intermediate, and then shipped my way over to Logan Park High School before somehow ending up at University of Otago. So, I think that’s been about two kilometres of my education radius. Sam: A very good high school. Shane: Very good high school. Shane: All our sons have gone there. Excellent. Excellent school. So, what got you involved with … What was your passion at school? Finn: Passion at school … I think I had the pretence that I was going to be a dentist. And I think that was – on reflection – that was a terrible idea. But I always, at the same time, wanted to do something right. I don’t really know where to put my thumb on the mark and say, “That’s what ‘right’ is,” but I’ve always felt like, if you’re going to be doing something, you should be at least trying to make a difference. And then what’s going on around you. Shane: Where did you pick that up from? Is that something you just developed, or is that something that’s part of your family? Shane: Do you think you actively tried to avoid it? Sam: I think he actively tried to avoid it. Finn: I think he would have been horrified to think that he was forcing a son to do something in particular. Shane: What did you do at school? Finn: Lot of music. Lot of music. Played in the jazz band. Played chamber music. Did science. Biology. Chemistry. Physics. No English – I dropped that as soon as I could. I thought it was terrible. A waste of time. I thought science was the way to go. I regret that one. Shane: Was what’s turned into, now, a bit of a direction in terms of sustainability … Did you know that was going to be there, underneath whatever the actual job you did? Shane: So, what did you do when you first got to University? Finn: I signed myself up for a double major – Bachelor of Applied Science in Energy Management and Environmental Management. I thought my pathway to success was becoming an electrical engineer. Someone who’s very in tune with the physics. What was going on with renewable energy systems, with conventional energy systems, fossil fuels. Understanding, doing the geography parts of it. Thinking this was absolutely the pathway to go. “I’m going to change the industry from within.” And then I realised that, holy-moly, I do not like the maths. If I came out and followed that degree through, I would have been a fairly average engineer. And I thought, “The world doesn’t need another average engineer telling people what to do.” And then I realised it wasn’t changing people through action, it was changing people through actually being the positive change I wanted – without becoming an engineer. That politics and people were really the problem that we’re facing these days. That we’ve got great wind turbines, we got great solar panels. Not so great hydro-electric, but still not burning fossil fuels to use them. Sam: Did you have a moment of epiphany that the problem’s not technical, but people? Finn: I think getting into politics – studying politics at the University of Otago – thinking, “Holy moly, this is great.” First of all, I was really into it. Really passionate. I always thought … Reading the newspaper in the morning – I’d get really excited about what you’re reading about – was just a hobby. And maybe it still is. But, kind of clicking and going, “Oh. Politicians are the ones who are telling people how to do things.” Policy-makers. Planners. All these people having such a great influence on how we actually use what we’ve got. So I’m not going to try and tackle what we’ve got. I think what we’ve got is great. But how we’re using it, on the other hand, is where the problem lies. In my mind. Finn: I wish it was the end of first year. I was a little bit stubborn-headed. I went and studied for two years, doing my Bachelor of Applied Science. And thought, “I need a break,” and went and worked in a hospitality job for about a year. And went backpacking around Europe. One of those classic, “I’m just going to escape from all my problems, and maybe find some energy for energy management again.” Give it a second shot. Came back, gave it a second shot, and went, “Ah, man, no, something’s not going right, here.” But at the same time, I was picking up a politics paper, and I was just killing it. Loving it. Having a great time. Such a great time that I was kind of skipping out on my energy management work that I should have been doing. Shane: Is it something fundamental about that energy management approach? Or is it you? Or a combination of those two? Finn: I think energy management is excellent if you’re going to end up working in the field, or maybe telling people how to work from within the industry. But I think – for me, personally – I think I look at a problem and, for me, it’s never the numbers game. The message we have is, “Fantastic. It’s such an easy sell. How come we’re not selling it?” And so it’s always been in messaging. Messaging, messaging, messaging. Where’s it going wrong? How’s it getting lost out there, and what on Earth can we do to actually bring it back into the forefront? Shane: So you should have been listening more to those English teachers and Drama teachers at Logan Park. Finn: Yeah. Yes. I’m sure the English teacher would have had a few words to say about my blog post writing. Still work in progress. Shane: So, you got yourself a politics degree. Sam: You sort of changed career on the basis of the first paper that you loved. Did the rest of the degree deliver on what you hoped for? Finn: If you say maybe from where you’re around from the start in a nursing degree, or a law degree, sending you directly into a career of law or nursing. A politics degree, I think … I got pretty tired of people asking if I wanted to be an MP. But I think it’s certainly and interesting way to study how things are happening. It’s a study of people in a very strict environment, if you talk to a political scientist, political theorist. I’m sure that I can say politics is very broad, and I’ve had to write many an essay on all that. But you say politics, and the governance, and the systems, and the understanding of power relationships and how they form – why they’re there in the first place – you have a different lens through which you approach things. You realise you can be a sort of normal citizen, but you’ve got a extra pair of glasses that suddenly see through all the nonsense that’s going on. And you go, “Why do we have to accept this?” “Why do we have to accept that?” “Why is this person even here? What are they doing? They’re monstrous.” They really don’t care. What are they in it for? Is it just a meal ticket for these politicians? I don’t know. Sam: And why has it turned into such a game? Or theatre, perhaps? Finn: This is one of my struggles. This could leave me leaving this interview, going home, and just staring at the ceiling for a long time. How does it end up like this? People vote for their instinct. People vote for what makes most sense to them. They voted for their interest. And you can’t fault them for that. You can’t fault someone for voting for something they believe in, because it’s just sensible to stand up and say, “I should take care of myself, because that’s in my best interest.” And so you sit there like, “Why is that your best interest? What’s been teaching you? Who’s been teaching you? What’s been involved in your life to make you think that that is your version of the optimal outcome?” That’s the problem. And then you get politician that reflect that behaviour. They’re merely a mirror of their constituents. People who just voting for self interest. Finn: No, you can’t break politics – unless you somehow inject a whole lot of money into it, so it’s represented by corporations. But democracy … You’ve just kind of got to accept it at face value that it’s everyone gets a say. Sam: There seems to be a lunatic in the White House. Sam: And in the meantime, he appears to have fallen out with Europe. Sam: Pulling out of Paris. Finn: Oh, no. I guess that’s the problem with international agreements. International agreements always pretend to be some sort of higher authority upon states. “Look, we’ve got the UN now. Now we’re going to tell you what to do.” No, no. Every international agreement’s just pretend. People buy into it because they can, or they want to. And so they’ve got to think that there’s a reason why people should get involved. So if the US pulls out, and they think it’s not their interest, you can’t do much to stop them. Sam: If, when they do pull out, what’s the message for New Zealand politicians, do you think? Should we pull out too? Finn: No, I don’t think we should pull out. I think, when you’ve got the US pulling out, yeah, that’s definitely not good. But the fact that China and India are still committing to it – and they’re the sort of economies that you’ve really got to worry about with that sort of transition. They’re the ones who are often brought to the negotiation table and think, “Why should we commit to this? You’ve had a life of luxury, United States, New Zealand, Australia, Great Britain. Why should we not follow in your footsteps? We have every right to industrialise. We have every right to develop.” And the fact that they’re buying into this and continuing to say, “We’re going to move forward,” is very optimistic. It’s a great sense of possibility that these countries are still continuing to think that this is something worth following. Shane: So, you finished your degree? Sam: And then went back for another one. Finn: Back for a master’s. Shane: Must be in the blood. Finn: It’s terrible. I don’t know what I was thinking. I think I made one smart call, in that the Masters of Politics has only been around for its second year, now. I thought, “I don’t really feel like being a guinea pig.” So, I worked in hospitality, again. Kind of escaped, I think. From where I started university in 2011 until last year, I’d spent quite a long time in and out. And I thought, “Time to just have a wee rest.” Stop thinking about it so much, academically. Do my volunteering. Do my activism, but also take a break. Recharge. Give the batteries a chance to get going again. Shane: So, eventually, you got back? Shane: And you’ve decided to do what? Finn: For my Master’s of Politics? Factors of water scarcity in conflict in what will be the Middle East will be my case studies as part of my dissertation. But it’s a part taught, part dissertation in master’s. So I still have my theoretical “Theory of Politics” paper, and then I have comparative regional conflicts. I still have to learn the whole suite of things expected to come out as an Pols student. Sam: Did you say, “as a driver of conflict”? Water scarcity? Finn: Yeah. As a factor, I think … When you read political journals talking about climate change and conflict, the narrative is not always the same. An I get a bit bemused by that. But I guess all my friends from Generation Zero – sustainability-minded people – go, “Of course climate change is related in scarcity. How could you not think that?” And because there’s water scarcity, of course there’s conflict. Water scarcity runs into crops. Disease. All these sorts of other factors. Of course there’s a relationship. And I’m sitting there going, “Okay. Okay. Okay, I’ll have a look at that.” I want to pull that apart, and really look at what the academics have been writing. Sam: Presumably, just to jump ahead to a thesis you haven’t written yet … You’re going to be concluding something about complexity, systems thinking, wicked problems … It’s all that mushy stuff put together. Sam: You already know it’s not as simple as yes or no. Sam: Through that politics degree, things like complexity, system thinking, wicked problems … Are they a thing that we’re actively teaching people? Sam: Does political theory cope with that kind of complexity? Finn: No, it doesn’t. Not at all. It likes to think it does, but when you start applying it you realise you almost have to become a complete specialist in one country, or one conflict to really know such of the information that’s going into it. You can’t … Specialist in the Middle East, and even then, they specialise in Syria. And then they’ve got no understanding of what’s going on, necessarily, in the Pacific Islands. And you’ve got someone else going in there. And it’s just … It’s interesting stuff. There’s no doubt. But as soon as you start getting into it, you realise you can’t really make proper claims, assessments, or forecasts without understanding the information. It just gets so complicated so bloody quickly. Sam: So, somewhere along the line, you decided not just to study stuff, but to do something about it? Sam: What led to that? Finn: I think that itch was going on in the back of my head, going, “You’ve got an obligation to be the change that you want to see going on. If you want a future, why not fight for it?” I can’t just expect to sit at my computer all day, wonderfully, in bliss, playing on my computer, reading news articles, and then expect someone round the street corner to show up and show me what the world could be like. What a nice Utopia world we have amongst us. I realised, “Oh, crap. That’s going to have to be me.” Or that’s going to have to be people like me, who want to see the change going on, and realise that the political process doesn’t involve waiting every three years for an election to come along. And so, I found out three years ago that the group Generation Zero – which I’d just heard about – was doing enrolments on campus for the students. And that main goal there was actually to be completely non-involved of the politics of it. Whether you’re a National voter, Labour voter, Green, New Zealand First, ACT … We didn’t care. We said, “If you’re a young person, you should be participating.” We held events. We had a gig down at Refuel where the door entrance fee was signing up and proving that you’re on the electoral roll. And if you weren’t on the electoral roll, we had a form right there. And I remember I got my right hand onto TV-3. It was in some back shot somewhere, writing on a form. Sam: So, give us Generation Zero 101. Finn: Generation Zero 101. So, nationwide organisation – wonderful – where a sort of governance going on at a national level. And then you have teams based in every city, and they’re relatively autonomous. I’m the convener for Generation Zero Dunedin at the moment, or co-convener, with another person. And we do what works for Dunedin, I think. We don’t have a lot of people coming from national level team and saying, “Dunedin needs to be doing this, because this is the most important thing for all of New Zealand.” We kind of sit there as our group, and we go, “What’s going on in Dunedin? What’s actually the problems? Why is South Dunedin a big issue? What’s going on with cycleways? What’s going on with housing? Why are these things not being addressed, and how can we, as a group, best target them? You find that all these major centres in New Zealand – really slowly but surely – having sustainability and Generation Zero’s vision embedded into what’s going on. So that cycleways are getting passed because there’s been a record amount of submissions coming through one of our online forms. I think Auckland team has the pride of having one of the largest submissions ever held for a consent application for the SkyPath. They adopted it. Their SkyPath wasn’t their plan, but they found out, and thought, “Wow, this is bloody excellent. How can we best make this happen?” And so they wrote an online form, basically got a couple of text boxes for people to come in on their website and say, “Yes, we want this.” And I think they got 10,000 submissions. Which I think, for anything of its kind, it was the largest. And then councillors found out about it and said, “Yes, that’s all right.” They tried to do it again, and counted it as one. So, we had hundreds of people would come in. Thousands, whatever. They would say, “That’s the Generation Zero submission.” And we’re, “Oh, crap, we’re going to have to change our form options, because otherwise they’re going to … One person vote at a council policy submission doesn’t really count for much.” So we had to change all the forms, so everyone gets their own name put on it. And we just adjusted the system slightly, and carried on. Writing a whole boatload of those. Sam: Is influencing the people who are sitting around the tables making decisions … Is that the best way of making change? Finn: I think it’s one of the ways. That’s how I feel. I think there is a fairly comprehensive sustainability – so climate change – or transport movement going on in New Zealand. Or, I can speak for Dunedin – say, Dunedin, I think, has got a very interesting one. And trying to figure out what piece of the pie you make up. Everyone contributing in some particular area. You’ve got students for environmental action doing environmental focuses on campus. You’ve got SPOKES, who do cycle-related things. And we think, “How can we best fit into this piece of the puzzle, so we’re not doubling up?” We’re not expending unnecessary energy doing something that’s been done before. And the councils, planners … Whenever they hear us come along, they almost say, “Please come back. Come back for more. We need to hear what you people actually want to say.” It’s like finding out you’re the youngest person in the room by half, and then it’s amazing if someone in their 30s shows up, and you’re 24. Shane: Not just because you’re turning up, and you’re young, but because you’re turning up and being constructive. Sam: Yes. Because you make a point of not just having a submission saying, “We don’t like this,” but actually putting forward quite detailed proposals, and things. Basically, because the planners know exactly what they’re doing, but they’ve got to write a plan that is the will of the people. And the people are showing up and abusing them. They don’t write very much. And what they write isn’t very helpful. and so we sit there and go, “We want to be helpful. What can we do? How do we say it?” Because as soon as you show up to a council meeting, you show up to anything, and you say, “I would like this,” they can do something about it. But they can’t write a vision for the city as much as they would like to. Sam: You’ve clearly identified a point of leverage, there, that’s actually making a difference. Which is what you said you wanted to do. Sam: Do we also need to take the community along with us? Finn: I’d love to see the community come along for a ride. That’d be great. But, I mean, we are busy. Sam: Do you get accused of being one? Finn: Lee Vandervis described me as a climate change fundamentalist. That was wonderful. It was great fun. I had a great chuckle. I thought it was the best thing ever. I thought, “If only he knew what I looked like.” I went along to a meeting a couple of weeks after he’d said that, and he couldn’t spot me in the crowd. He had no idea who he was talking to, obviously. I mean, he was referring to Generation Zero, the climate change fundamentalists who want nothing but to ruin his life. There’s a UN Youth meeting happening in a couple of weeks, and they want to talk about how to get young people involved in politics. And to make sure they do their bit. And I was tempted to go along, but I realised I’m so busy – full of exams and essays, and I got no time for … And then I sort of found out what they wanted to do. And it’s basically trying to get them involved at a national level or politics. And I thought, that’s not … Just stamping your meal ticket every three years and saying you participated is not what politics really is. It’s showing up to the meetings. Actually being a consistent voice. Actually saying, “What can I do at this meeting to embed sustainability into everything that’s being said?” If the DCC has every policy document coming out for the next ten years, and some group of plucky young people have made sure that everything says, “sustainability” in some way or another, they can’t really avoid it. They don’t really have a choice, at that point. They’ve got to do what the document says. Sam: You’re calling yourself Generation Zero. Is there a generational divide? Finn: Sometimes it feels like it. And then sometimes I have bigger supporters – retirees. It’s unfair, I think, to categorise everyone as, “Oh, you’re old, and you’ve got your foot out the door, and you simply don’t care.” I think that’s not true. I think there are a lot of people who see what we do, and some of our biggest supporters are from some of the older communities who think they’ve got a good message, and we can certainly give them our resources to help them achieve what they want to do. Is there a bit of a divide? Maybe, but in our advantage. For some reason, people think that when a young person shows up, a lot of the time that you don’t have to display all these sorts of credentials. You don’t have to wear your badge on your shoulder that says, “Oh, look, you’re a planner, you should know exactly what it’s talking about.” “You’re a lawyer, you need to go all … ” We’ve got these people who basically have these same sorts of credentials. Certainly not the industry experience that some of you would desire. Shane: I mean, I think it could be part of that, as you say, you’re busy. Shane: Or, you could just be having a party. Sam: Yet, you’re deciding to put your time into this. People give you some respect for that, I think. Finn: Yeah. Seems to be the case. Sam: Generation Zero makes a point of being apolitical. Politically active, but not aligning with any party. Finn: We try to avoid it. Shane: Despite the fact that some obvious connections to one side, if we put it on a left/right continuum. Finn: Up until now, yes. Since we released out Zero Carbon Act, actually, there’s been a lot of buy-in from National, which has been humbling. Surprising. Stunning. What on Earth do these guys want to do, stepping foot near this document? And I think it’s a really promising sign that maybe this change is going to happen. Is this really going to be the[party’s initiative it’s always been? Or is the shift happening? What’s going on? Struggling. Don’t know what to do. There’s no one to attack. Shane: So, tell us what the Zero Carbon Act thing is? Shane: Has Generation Zero – locally or nationally – worked out what you’re going to do, running up to the election this year? Finn: Locally – I don’t want to quite say it, because it’s always got a bad word, but – lobby. People always have negative connotations of what lobbying is, because you think, “Money, guns, tobacco, alcohol, and drug companies.” And then you go, “Wait, why can’t we have nice green sustainability lobby, too?” We don’t have much money, but at least we’re cool. So, I think Generation Zero Dunedin … This year, leading up to the election, we’re going to spend a lot of time doing our standard meat and bread policy. Work with the council. But we’re going to be targeting a lot of groups, saying, “We want you to come in and buy in with us, and say that this is something you need.” That sustainability – climate change, all these things – requires a framework to work with it. If a government’s not doing it, you’re kind of swimming against the tide. If the government’s not providing you the framework to do it, how can we expect the local councils to enact it? They’ve always sort of expressed that they’re sort of hamstrung by what national governance wants. And so, if we can get them to buy in … We had the greater Wellington regional council chair saying he wants to get all the local councils together and lobby on the behalf of the Zero Carbon Act. And I thought, well, I guess I’d better ring up Dave Cull then. I haven’t done that just yet. But that’s something we want to do. We want to make it an issue as such that where … Come next election – when it’s happened, end of September – and we’ve got a new sitting government, that they can see that this is something that young people, old people, middle-aged people, from all across the board see this as a vital part of our future. And that some bandaid policy coming out from one side is not quite going to cut it. Sam: You said it, probably – climate change, that is – probably won’t be an election issue. But it looks like water might be. Finn: Yes. Trouble trying to segue into it, I think, when you try and bring the conversation to climate change. People sometimes just shut off. And then go, “Why this? We’ve got housing. Climate change? We can think about that one next year. We got to figure out all these highways. Climate change can happen next.” And so it’s always on the agenda, but it’s always being deferred until next time. Finn: Come on, let’s do something about it. Shane: Do you have a go-to definition of sustainability? Finn: I had to think about this one. Being sustainable is acting or providing an action which you know, without a doubt, is going to be able to carry on in its form. It might adjust with the times, but a sustainable action’s something that will just carry on, no matter what. That’s how I thought about it. I don’t want to go into some deep … I can go on forever, I think, about what sustainability is. But for me, that’s … If you’re being sustainable, you’re doing something where you know it’s going to carry on. Sam: Some people are talking about sustainability not being enough, anymore. That we need to be regenerative. We’ve wrecked the place enough that just stopping and carrying on like we are … It wouldn’t be enough. Sam: Do you think … Do we have to not just slow the ship, but turn it around? Finn: I feel like … Yeah. There’s something extra that will need to be done if we’re not doing something now. If it’d been 1990, and we had sat down and said, “All right, guys, let’s stop it now,” no problem. Maybe that would have been the case. Now we’re sitting here thinking, “We’re going to have to give up something unless something else changes.” We can’t predict what’s going on, here. Sam: We’ve been using that line – that it’s not a lesser life, it’s a better life. Do you think we can still pull that off? 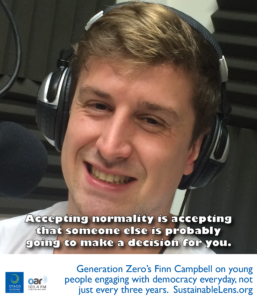 Finn: We’d have to change what is normal. We’d absolutely have to change what is normal, and I guess that’s part of what I’m trying to do, is trying to get people to think about what’s normal. What’s acceptable. Everything that’s going on at the moment – sustainability, whatever … Your life has been dictated by politicians. Policies. Personal choices. The influence of your parents. And all these things that … These are just normal. And right now this normal should not carry on. Can you live a happy life? Yes, I think so. But what we’ve got to accept now is that … Why are plastic bags still coming out of supermarkets? Why is there a terrible bus transport system in Dunedin? Why is it every time a cycleway gets put in, people put up in their arms and say, “These are terrible things”? Something’s got to change for what “normal” is. And people are going to appreciate that “normal” is just kind of accepting a status quo of what’s going on, and being an influence in the change that you want. Accepting normality is accepting that someone else is probably going to make a decision for you. Finn: Last couple of years? Interesting to think that far back. I almost feel like I’ve had setbacks with last election – Greens lost a proportion of the vote. Turns out if you enrol youth at the university you get a lot more conservative ones coming down from Auckland. So, maybe next year. Next time, we’re not going to enrol so many people on campus. Immediate success … Just recently, the Dunedin city council is finally putting funding back into environmental strategy. They gave options on their annual plan submission, and said, “Do you want $150,000, or $200,000?” And we went, “More.” And we got enough people to say, “More,” that they ended up giving us – not Generation Zero specifically, but the environmental strategy [inaudible 00:41:36] – $250,000, through complaining, and saying that maybe that’s not enough. We managed to get a 25% increase on the funding for environmental strategy. Sam: You’ve hinted at the answer to this several times. In fact, you’ve been explicit once. We’ll ask it anyway. Do you consider yourself to be an activist? Sam: So, we’re writing a book of these conversations. We’re calling it, “Tomorrow’s Heroes”. How do you describe your super power? What is it that you’re bringing to the good fight? Other than pretending you’re a grey old man and then going, “Wham!” I’m not letting you have that. Finn: I wouldn’t call it shape shifting, then, would it? I guess it’s all about people and communication. What I try and bring to the table is participation. My objective is making democracy easy. And when you make democracy easy, you make input – your idea of what democracy is – easy. And for hopefully most conscious, breathing people who want to see a future that does include some form of climate change/sustainability response in your daily life … And changing what we currently have – which is no good – to something excellent, which we can keep under. Finn: We’ve got the Zero Carbon Act. That’s certainly going to be a big challenge. One of my personal challenges will be ensuring that this sort of movement doesn’t die off – when it’s happening because you need it. I don’t want this to be a reactionary movement that says, “We’re going to be here because there’s a problem. And as soon as this giant, pressing issue goes away, and we think the solution’s gone, we’re just going to sit down on the couch and ignore it.” I want to see that people take a more proactive, continuing approach to how they live their lives, but also their participation in everything. We got this way because we didn’t act until we needed to. So let’s not get it so we act until we need to, next time. For whatever that may be. Sam Okay. Very quickly, because we’ve almost run out of time. Sam: If you could wave a magic wand and have a miracle occur, what would it be? Finn: Just, change the normal. Change what is normal. Sam: And advice for listeners? Finn: Participate. Participate. That’s the best part. Shane: Fantastic. And we’re going to leave it there.